There comes a time in every munchkin's career when he's taken on more than he can handle, bitten off more than he can chew, gotten in over his head. So run away! And laugh! It's time for — the Narrow S Cape. With 112 cards to enhance your Super Munchkin game, The Narrow S Cape is much more than just this season's favorite fashion accessory! It teems with new villains like the contemptible Cheese Wiz, Gothzilla (with earthquake-causing platform boot action! ), and the Ratwoman. And lest you feel overwhelmed by villainy, this expansion also features new items, new Powers and a new Class: the Brain! Wield the Slide Rule and Power Ring against Sister Blister! Tackle Tackyman with the Trampoline! Survive the Two-Hour Monolog because you were Raised By Armadillos! And flee from Shaenon K. Garrity's fearsome Foot and the unfortunate, mind-controlled Too Much Coffee Man! 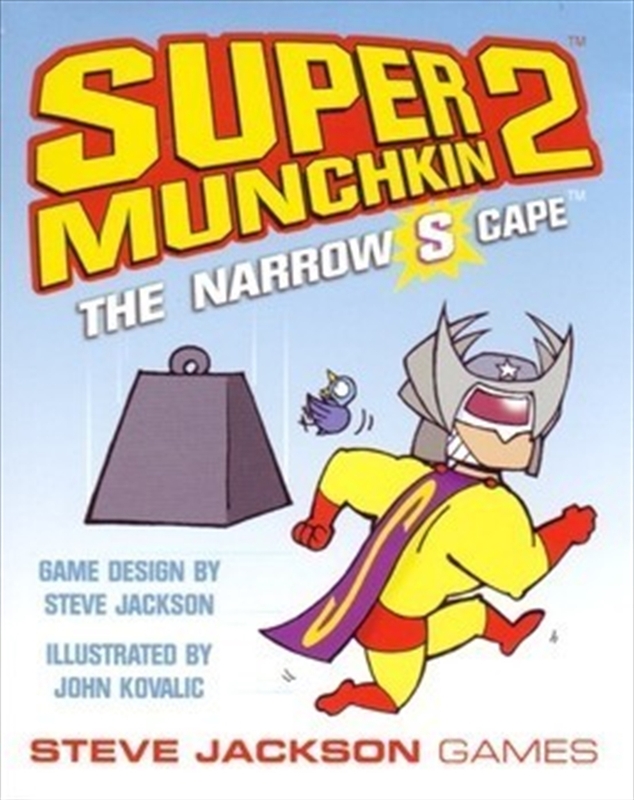 Super Munchkin 2 — The Narrow S Cape . . . the newest super-expansion for the bestselling Munchkin series.